A teenage rom-com sprinkled with a bit of relatability and diversity is the perfect way to describe “To All The Boys I’ve Loved Before,” a slightly cheesy movie with a predictable ending that will nonetheless keep you on the edge of your seat. Based on Jenny Han’s best selling book, “To All The Boys I’ve Loved Before,” Lara Jean is Image from ScreenRanta 16-year-old romantic at heart through and through, dealing with her major crushes by writing them a love letter and storing it in her hatbox. 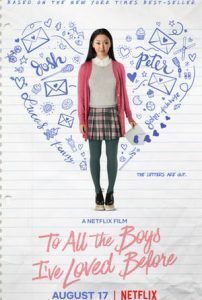 When the letters are sent to all the boys, Lara Jean Covey (Lara Condor) finds herself forming a ‘fake’ relationship with one of the boys, Peter Kavinsky (Noah Centineo), turning her life upside-down. “To All The Boys I’ve Loved Before” has the typical love story plot, but does the movie stray too much from the book? Like most novels made into movies, the movie has a few plot changes. One change is how the letters are sent out. In the book, it isn’t revealed until the end that Kitty, Lara Jean’s younger sister sends them out as revenge. In the movie, however, Kitty (Anna Cathcart) sends the letters out of sisterly love. I personally thought this was a nice idea, but it removed one of the major mysteries of the whole story. While reading the story, readers are also trying to figure out who sent the letters out. Another difference in the movie is the reason behind Peter and Lara Jean’s relationship. In both the book and the movie, Lara Jean wants to show Josh, her older sister Margot’s boyfriend, she’s not in love with him. In the book, Peter wants to show Gen, his ex-girlfriend, that their relationship is over. In the movie, Peter wants to make Gen jealous. This change didn’t impact the plot that much, making it more interesting when Peter reveals his true feelings for Lara Jean. The movie also ends differently than the book, but it could be because the book is only the first book in a series. I believe there should be a sequel, but with the way the first movie ended, it might be different from the series. Not only are there changes in the plot, but changes in the characters as well. In the book, Lara Jean is a romantic at heart, but she is also very crafty and spends her free time baking, which was omitted from the movie. I personally did not like this change because it also changes some of Peter and Lara Jean’s scenes. For example, in the book Lara Jean brings Peter and his friends some of her creations, such as cookies and cupcakes. Also, we don’t get to see much of Chris, Lara Jean’s best friend, in the movie. Although some may argue Chris is a better friend to Lara Jean in the movie, we miss out on a lot of their relationship. We don’t get to see the nature or history of their relationship, including how they met and all the memories of them hanging out together. Lara Jean, however, ends up befriending Lucas, one of the boys to receive a love letter. While their relationship isn’t as developed in the book, their friendship in the movie was supportive and adorable. While “To All The Boys I’ve Loved Before” mostly stays true to the book, there are still some parts that are missing. If you want more of Peter and Lara Jean’s relationship, be sure to read the series by Jenny Han. Crier quiz: Which character from “Stranger Things” are you?